Campbellton is an unincorporated community in Atascosa County, Texas, United States. An Irish immigrant, John F. Campbell, began the community in the 1860s by promoting settlement in the area. According to the Handbook of Texas, the community had an estimated population of 350 in 2000. It is located at 28°44′51″N 98°18′09″W﻿ / ﻿28.74750°N 98.30250°W﻿ / 28.74750; -98.30250 (28.7474820, -98.3025108), at the junction of U.S. Highway 281, FM 1099, and the Atascosa River in southeastern Atascosa County, approximately 12 miles (19 km) east of Christine and 54 miles (87 km) south of San Antonio. Campbellton is part of the San Antonio Metropolitan Statistical Area. Although it is unincorporated, Campbellton has a post office with the zip code of 78008. Public education is provided by the Pleasanton Independent School District. ^ a b "Campbellton, Texas". The Handbook of Texas online. Retrieved 2009-08-11. 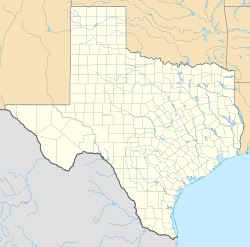 ^ "Campbellton, Texas". Texas Escapes Online Magazine. Retrieved 2009-08-11. This article about a location in Atascosa County, Texas is a stub. You can help Wikipedia by expanding it. This page was last edited on 14 March 2017, at 16:49 (UTC).